Download all four Christmas crafts! Decorating for the holidays can be a creative experience when you make your own Christmas decorations. Guests will be inspired by your home's unique holiday beauty, and you'll be proud to show off your space. When guests arrive at your home for the holidays, the first thing they'll notice is this festive holiday wreath. All the materials for this project are available at your local craft store, and you can make the wreath for under $20. Soon, you'll be welcoming guests with the sound of jingle bells. Using the wire cutters and pliers, form the wire into an open circle. This circle will be roughly the size of your wreath. Starting at one end, string the jingle bells onto the wire. 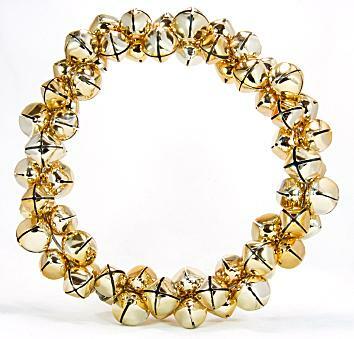 Make sure you fit as many bells as possible onto the wreath by turning the bells in different directions. Use the pliers to connect the two ends of the wire to form a circle. With the ribbon, make a large bow to cover the area where the wire is joined. Next, use the ribbon to make a hanging loop. Use the hot glue gun to secure pinecones to the wreath. These adorable dishtowels will brighten up your kitchen for the holidays. They also make a wonderful holiday hostess gift. Prewash the towels and the fabric for best results. Choose a holiday fabric with a simple, large print. Ideal options include poinsettias, Santa faces, wreaths, and other Christmas motifs. Cut out one of the objects in the print, leaving a space of about a quarter inch all the way around. Carefully pin the piece of fabric to the towel in your desired location. Sew around the raw edge of the fabric using a zigzag stitch. Pin one or two stripes of ribbon near the edge of the towel. Use a straight stitch to sew the ribbon onto the towel. Trim the ends, and tuck them under. 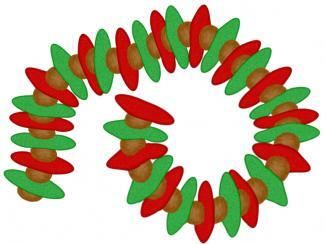 Making your own Christmas garlands allows you to customize the length and colors to fit your home. 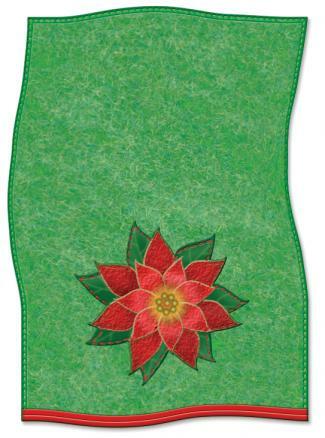 You can either purchase craft felt rectangles in various colors for this garland or buy felt by the yard. Depending on how long your garland will be, you may find that one option is more cost-effective than the other. Choose surprising color combinations like sage green and white or red and gold to give your garland a really creative appearance. Spread out the felt on your work surface. Place a round object on the felt, and trace around it with the dressmaker's pencil. Continue tracing until you have lots of felt circles. Cut out the felt circles and stack them up, sorting by size or color. 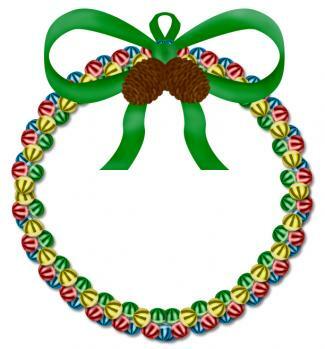 Decide on the length of your garland, and cut the embroidery floss to be two feet longer. Tie a knot in the embroidery floss one foot from the end. Thread the other end on the needle. Poke the needle through the center of one of the felt circles and pull the floss through until the circle reaches the knot at the end. Next, string a wooden bead on the floss. Then add another circle. Repeat until the garland is the desired length. Tie a knot at the end of the garland, and then use the ends of the embroidery floss to hang it up. Looking for a way to incorporate nature into your Christmas decorations? This project gives you major impact and lots of room to customize for your own style. Start by choosing a branch that's the right size for your wall. Hold the branch up against the wall where you're planning to hang it, and trim off any excess pieces. You'll want the branch to lie flat against the wall in at least two spots. Mark these spots with a marker. Twist craft wire around the spots you marked, and create a hanging loop for each spot. Make sure the wire is secure, and then trim off any loose ends. Take the branch into a well-ventilated area, and spray paint it in your desired color. You may need more than one coat. Allow the paint to dry completely before continuing. Cut the green ribbon into random lengths, ranging from about 12 inches to about 24 inches. Hot glue a pinecone to each end of the ribbon lengths. Allow the glue to harden. Tie or loop the ribbon over the branch at random locations. Secure with hot glue if necessary. Mark the wall where you'll be hanging the branch, and attach it to the wall with the wire loops. When you create your own holiday decorations, you'll immediately make your home feel more personal and interesting, and you can have the exact holiday look you want. You don't have to settle for a color or style that isn't quite right, since you can choose materials to complement your theme. What's more, you won't see the exact same decorations in your neighbor's living room.